ขนาดใบที่วางโน้ต 81 มม. X 40 มม. A conductor's desk for mobile or stationary use. There are pull-out music racks on both sides made of black wood. 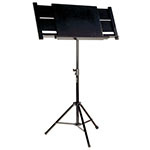 The bottom part, which is made of black powder-coated steel tubes, is quick and easy to set up and fold back up, and it is convenient to transport in just two parts.